Love it or Leave it, Valentine Day, the holiday of love is right around the corner. It doesn’t matter if you are going on a special date for a romantic night out, looking for one or just a walk with friends and family, you want to look your absolute best with an amazingly healthy and rosy glow on a special day. Whether you are going for a romantic sojourn with your beau, attending a live show, enjoying dinner for two or dancing the night party, Valentine’s day is the perfect opportunity for you to bond and reconnect with your partner and loved ones. If you’ve got a new boyfriend, a hot date, or a tried-and-true love, Valentine day gives you the perfect excuse to pamper yourself to look romantic, sweet presentable, attractive with flawless looking radiant skin with a youthful glow. 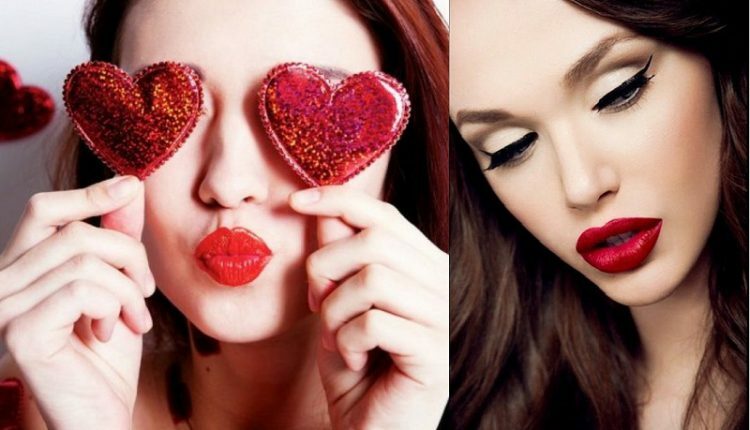 Beauty Diva Shahnaz Husain shares perfect makeup tips on how to get your skin in tip-top for you and your loved one on special day popularly remembered as Saint Valentine’s Day. If your skin is clear, leave out foundation during the day. Use baby powder or compact power. Pay more attention to the oily areas of the face, like nose, forehead, and chin. Press the powder all over the face and neck, with a slightly damp sponge. This helps it to set and last longer. If you want to use foundation at night, choose a water-based one. Add a drop of water for lighter coverage. Before applying foundation, apply astringent lotion if your skin is oily, or moisturizing lotion for dry skin. Wait for a few minutes to allow the skin to absorb it. Next, use concealer to cover up pimples and scars, if any. Or, use two shades of foundation. One shade should be as close to your skin colour as possible. The other should be a shade lighter if the blemishes are dark. Take a little light coloured foundation and apply it directly on the pimple or pimple scar. Avoid rubbing or smearing. Pat it into the skin. Then apply your normal foundation on the face and using a moist sponge, spread it evenly, going outwards. Remember the neck too. Blending is important to achieve a smooth finish then apply tinted loose powder on top to “set” the foundation. Or, use compact powder. The blusher comes next, or you can apply it at the end. Use powder blusher. Pink or peach blusher would suit most skin tones. Apply on the cheekbones and slightly below it. Use your fingertips to dot the area with blusher. Then, blend with the brush, outwards and slightly upwards. Apply highlighter on the cheekbones. Highlighters should not be white. Choose from ivory or pale pink. Blend well. For the night and for a more dramatic effect, use a dark brown or dark grey eye shadow on the eyelids close to the lashes and stroke it upwards and outwards. For the smoky-eyed look, line the eyes with eyeliner close to the lashes and then smudge the eyeliner slightly with a sponge-tipped applicator. It should not be a harsh line. For the lips, plain gloss can be enough for the day or add a touch of gloss over light pink or mauve lipstick. Coloured gloss is also available. Avoid using lip liners and just brush the lips with lipstick, going for shades of pink, from pale pink to rose or tawny pink. At night, go for rose, coral or bronze, or just stick to pink.